•	G&G Combat Machine CM16 Raider GBB – Scott Allan’s not a big fan of gas guns but is he tempted by G&G’s GBB version of this low-budget, high-quality rifle? 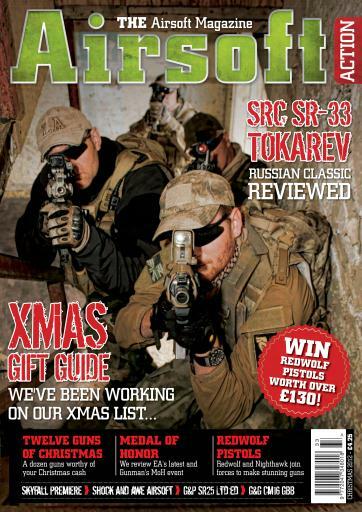 We’ve managed to cram a lot into our special Christmas 2012 edition of Airsoft Action! 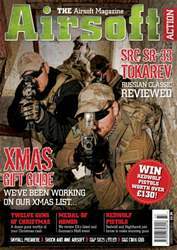 We’ve put together our own mammoth Xmas List for Santa, featuring dozens of our favourite bits of kit, and Michael Jones has compiled a solid list of 12 guns that deserve your Crimbo cash, whether you’re a newbie looking for your first gun or an experienced skirmisher. 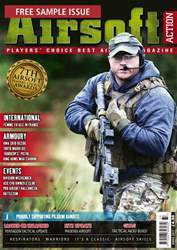 Elsewhere this issue we review EA’s Medal of Honor Warfighter to honour its UK launch, and check in with Gunman Airsoft as they hold a dedicated event for the EA crew to get a taste of what real action is like! We follow the Tier 1 team on its latest Afghan-themed MilSim epic while Ron Mahoney gets stuck in at Shock and Awe Airsoft in north Wales. We report from the Royal premiere of Skyfall, Billy Basics advocates double (and triple) checking and Gadge puts together a Cold War load-out for the ‘softer on a tight budget. We’ve also got some exclusive competitions you really shouldn’t miss, so grab a copy and get involved – merry Christmas!